Autism spectrum disorder has received increasing research in recent years, with more information on assessment and treatment than can be readily assimilated from primary literature by clinicians. 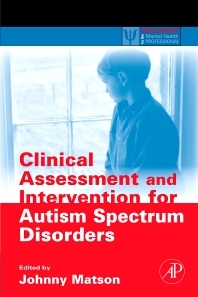 Clinical Assessment and Intervention for Autism Spectrum Disorders summarizes evidence-based assessments and intervention for Autism across the life-span, providing clinicians with a practical overview of how best to assess and treat this disorder. The book begins with a discussion of what warrants a determination of being "evidence based" and a description of the disorder from a life span perspective. The book also provides a chapter on differential diagnosis of autism relative to other disorders. What follows are separate sections on assessment and intervention. These chapters discuss first how to assess and then separately how to treat behavioral problems, communication and social skills issues, academic and vocational skills, and the use of pharmacology and an assessment of possible pharmacological effects. Intended for practitioners assessing and treating children with developmental delays, the book provides clinicians with best practices for assessing and treating delays associated with autism. Very informative and organized well.